Cherie used to be the "flower girl" at Kroger's here in Clarksville, but later moved to the New Albany store. She was in charge of the flower shop. 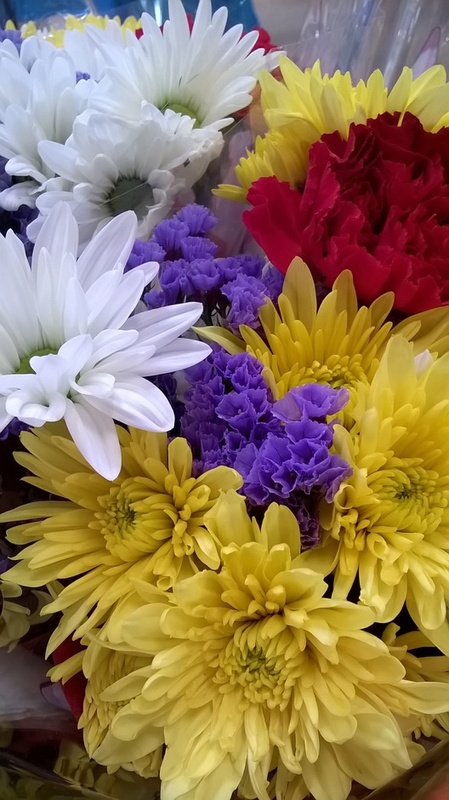 Whenever I was in Kroger's, I looked at her beautiful flowers and she always let me take photos of them. 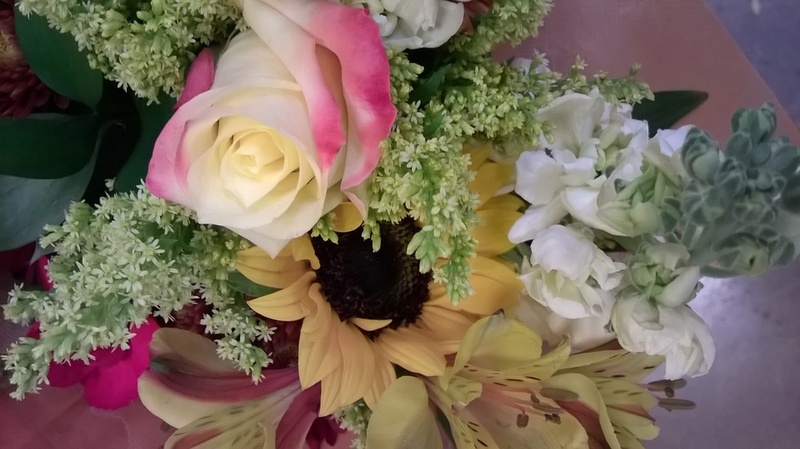 I have many beautiful photos of her flowers. 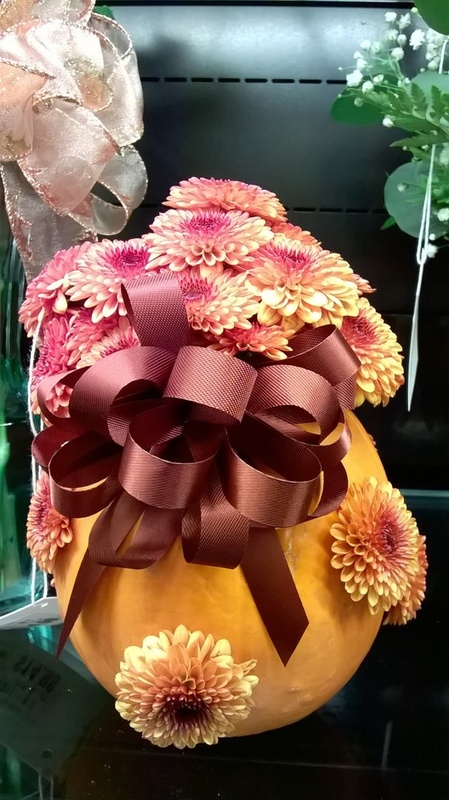 She was just getting in autumn flowers and decorations that day. She had cute scarecrow decorations everywhere and I took this photo of some of them. But I go on beyond the point where the “monster” tree lies across the water. I know I have to turn back now. It has become an eerie place of light and shadow. I have a fearful feeling I might be lost. I keep on going and soon I am greeted by laughter and the strains of “Red River Valley”. I am back in our world again and lunch is ready. As he passes through my secret place. Note by typist, Mary Hazel Upton: This is another of the poems from Mama’s very old poetry book. I copied it as she wrote it except for a few very minor spelling and punctuation corrections. In her handwritten book she has the last line circled and in the margin has written “In this my secret place”, so perhaps she meant to change the last line to “As he passes through in this my secret place”. I have no way of knowing, so I left the poem as she first wrote it. I don’t know where her “secret hiding place” might have been. I know she loved all the wild places and all of nature. 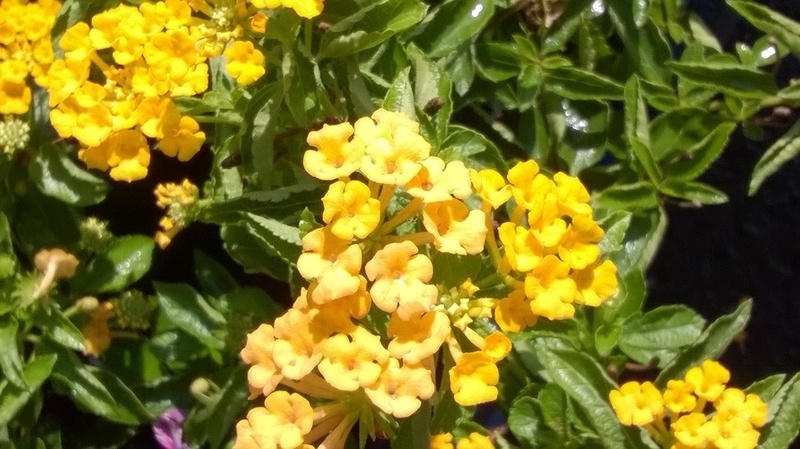 She saw God’s handiwork in them all. Most of them she shared with me. To the end of her long life whenever either of us saw anything beautiful, a sunset, a full moon, snow sparkling in the sun, if the other person was around, we would find them and share it with them. Mama lived to be almost 91. 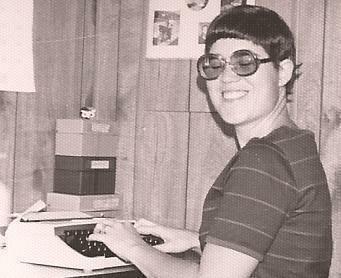 She has been gone since April 2011 now, and I am trying to get as much of her writing typed up to save for her as I can while I still have time on this earth to do it. 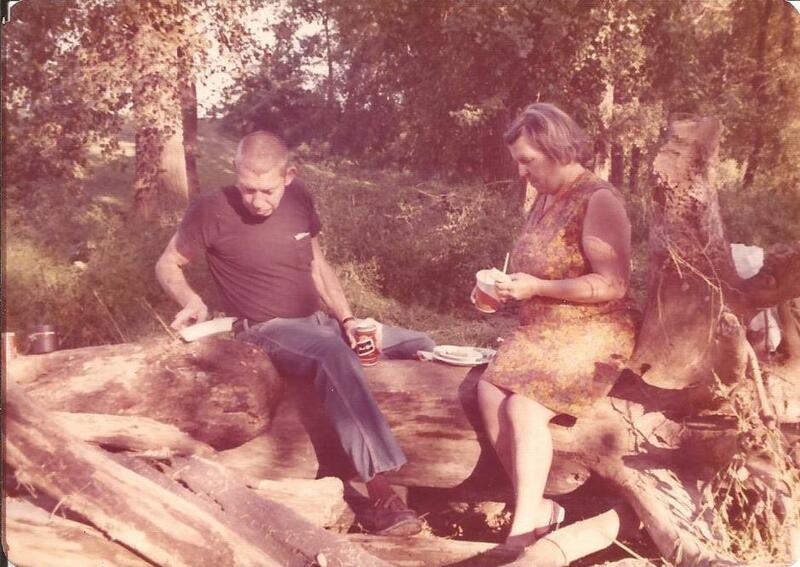 This photo of one of Mama's and Daddy's long ago picnics at the river was in one of Mama's old photo albums. The river park is close to our house and also close to Colgate's where Daddy worked. Mama told me that sometimes she drove to Colgate's to meet Daddy when he took his lunch break and they had a picnic at the river. There was one neighborhood bar that was close to Colgate's and that Daddy and the other men went to sometimes on their lunch breaks. They also had plate lunches and she said that she and Daddy were even trusted to borrow their dishes to take their picnic to the river because the owners knew that they would return the dishes. I don't think the bar is there anymore, but I remember Daddy bringing out their special hamburger sandwiches made like meatloaf and with tomato sauce, served on buns and wrapped in waxed paper for us kids and Mama sometimes. There was no family room there, and Mama did not like to go in a bar, so Mama, and my brother and I ate in the car while Daddy went inside to get a beer and sandwich those times when we were all together. If she met him at Colgate's for lunch, though, they would have borrowed the dishes and taken their picnic to the river. This picnic photo might have been food that Daddy got at this bar and that he and Mama took down to the river, or it might have been another time. I can't tell from the photo if the picnic dishes they are using are real dishes, like the bar had, or if they are paper plates. Burns Hollow Park, mentioned in Mama's diary entry is, I think, also no longer there. It was a small roadside park with a small creek running through it. Daddy usually cooked their picnic dinners on his Coleman stove there and most other places. I have a few photos of this park in her photo books and will later scan and publish some of them. She may have more accounts of picnics at Burns Hollow Park, and if she does, I'll publish them with the photos. If she doesn't have more accounts of Burns Hollow Park, or if there is nothing in the letters or diaries of mine, that I also have, then I will republish this account again with the photos. This photo is also from one of Mama's old photo albums. There used to be a small park by the river with just a few picnic tables. When we visited Mama and Daddy they often took us there for picnics. We either built a campfire to roast wieners or else Daddy cooked dinner on his Coleman stove. The river area has been preserved as part of a larger park now and, although it is good that it was preserved, it is not as nice as it used to be. You are no longer allowed to build campfires there. And the falls is blocked off by a high fence so that you can't get down to it from where the park used to be anymore. However, if they hadn't created the park it would have probably already been built up in private stores and apartments by now even though the river floods every year, and it wouldn't be very smart to build there. However, anything they can build up, it seems like they do, so they probably would have if they could! This is the official site for all the parks in Clarksville with many beautiful photos and information about all the parks. The Falls Of The Ohio park listed above doesn't belong to Clarksville, but the other river parks do. 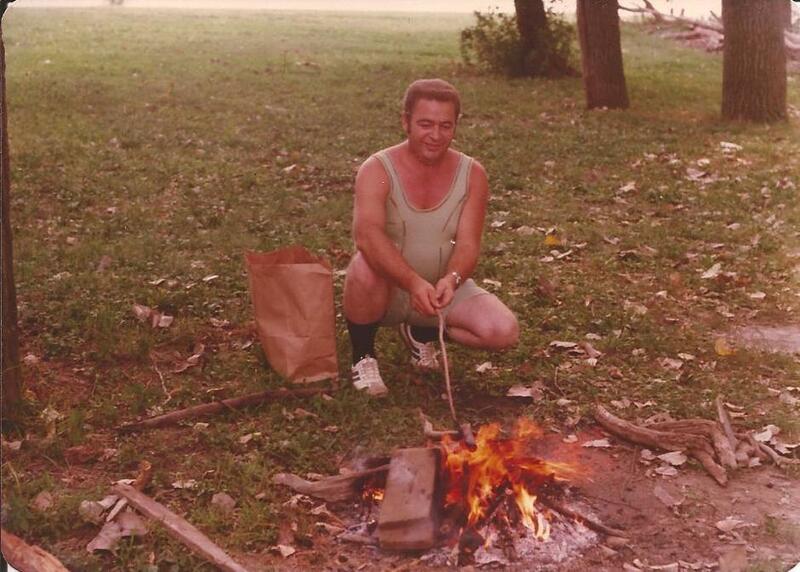 The place where Gain is roasting his wiener and that was the old picnic area is just down from Ashland Park, which is another very beautiful small park right on the river. The Falls Of The Ohio is further below the original picnic area where Gain is in the photograph. All of these river park areas are close together. The only one you have to pay to use is the Falls Of The Ohio, which is well worth the admission. If you live close enough for it to be worthwhile you can get a season pass, which I always used to do for Mama and me. We would go to the Interpretive Center and shop at the small gift shop about every month after I came down to stay with her. They had souvenirs and also lots of books about fossils and the river. I usually bought books. Usually we ate lunch at the Widow's Walk (listed here also in case you want to check it out). Within close driving distance and just down the road from where Hammerhead lived is another small park with a replica of George Rogers Clark's cabin. The Clarksville Parks website is listing it as Lewis and Clark Park now, but Hammerhead and I called it George Rogers Clark park. They have a special festival there in the summer and the park is always open (free), but the cabin may or may not be open because the guides are volunteers. So you may want to call the parks department before making the trip if you want to go in the cabin. I took Mama and later Hammerhead to the festival at the George Roger's Clark park. I also took Hammerhead to that park just to sit and look at the river often also since it was only a few blocks from his house. There is no camping at any of the Clarksville parks, but there is picnicking at all of them, and various events at some of them. They are all free, including going in the cabin at George Roger's Clark park. Correction: I won't erase what I've already written because the information about the George Rogers Clark Park is all correct except that it is not listed on the Clarksville Parks website, so maybe it doesn't belong to Clarksville, but may be a county park instead. What they are calling the Lewis And Clark Park on the Clarksville parks website is just across the street, a little ways up the street from the George Rogers Clark park. That park has a play area for children with a replica of an old boat for them to play on. I did not see any official site for the George Rogers Clark Park, and need to finish the blog for sure tonight (it is Thursday September 20, 2018 now as I finish the proofing). However I found and bookmarked this link with information and photos about George Rogers Clark Park. This is right across the street from Ashland Park. It is where Mama and I used to eat lunch when we would go to the Falls Of The Ohio park. It was closed for awhile, but is now open under new ownership again.They have an outside ice cream shop with a shady picnic area and a beautiful view of the Louisville skyline across the river. Or, if you want to, you can carry your food across the street to Ashland Park and use the picnic tables there, or carry your food into the coffee shop and eat inside. The ice cream shop also sells hamburgers, hot dogs, chips, etc. and rents bicycles. It is only open in good weather, but the coffee shop is in the main building, a restored historical home. The owner told me that it would be open year round and that they would have breakfast. This is a really nice place to eat. I often stop there to picnic on my way back from the library. I walk C.B. to the garage, careful not to step on snails, fat “creatures” of the night. They leave a trail of silver across the walk. I hear the strange, creepy cry of a little screech owl coming soft through the early morning dark. Kinda gives one a cold chill to hear him on such morning as this. Shadows are inky black under the trees in our yard. The grass is sparkling wet with dew and thick drifting fog. I can hear the Sept. song of the crickets. They have been coming in the house. Hunting winter quarters no doubt. No, I don’t hurt them if I can help it. Just kick them out as soon as I find them! Note by typist, Mary Hazel Upton: C.B. is my Daddy. He worked for and retired from the Colgate factory here in Clarksville. At the time Mama wrote this diary entry Daddy was still working. She always walked to the garage with him to see him off when he left for work in the early mornings. Mama’s poem, “The Fog” was untitled. It was just a few lines written in her very old poetry book. The book is so old that it has to be held together with rubber bands. Many of the entries are on scraps of paper. A few have been recopied into the book. “The Fog” was written directly in the book, along with other entries that I am sure she meant to go back and work on more later. I have copied her poem exactly as she originally wrote it except for taking the liberty of titling it for her. All of her diary entries are preserved as she wrote them also, except for occasional minor corrections in punctuation and spelling. A few of the words I do not correct the spelling because that is the way she always spelled those particular words. Mama's first diary entry and poem, which I titled September Fragments Of Mama's Diary And Poetry Book, was originally published by me on September 5, 2016 on Writers-Network. The second diary entry and poem, which I titled More September Fragments Of Mama's Diary And Poetry Book is previously unpublished. I published more of her writing and also mine on Writers-Network, and was going to publish more, but Writers-Network suddenly went out of business. I never could find out why. I have not removed the links to this site from my website here because I keep hoping they might come back online. They had went offline and came back on several times before. Now when I click their link it says that their account has been suspended and to contact your provider for details. I am not sure what that means. There was nothing on their website for anyone to object to and have them "suspended". So all I can think of that might have happened is that they either did not have time to keep up the website anymore, or could not afford to pay their website rent anymore. Regardless, I will leave the links on my website a little longer. And eventually I will publish everything I had on Writers-Network here also. I kept hard copies of everything except the additional notes I made for each post. I am sorry I did not keep them and will not make that mistake again. I had written some of them out by hand, so still have them, but did not know how to copy and paste then, and didn't make time to write all the notes out by hand. So they are probably lost. Live and learn! This is a photograph of the now abandoned Colgate Soap Factory here in Clarksville. 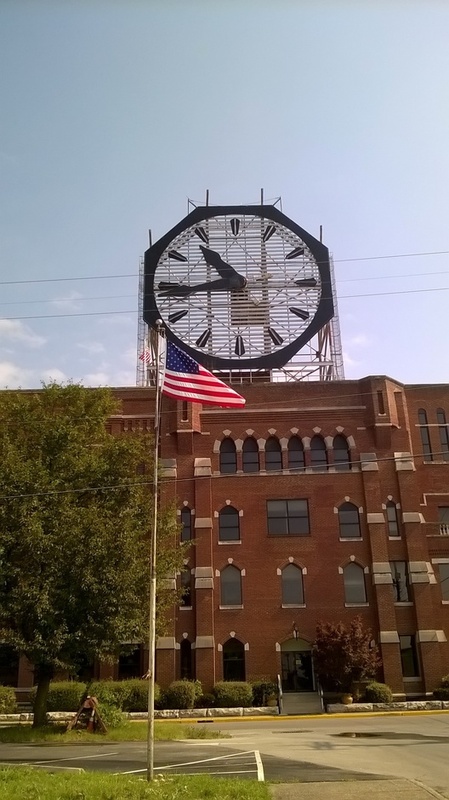 The clock on top of the old factory is a landmark, the second largest clock in the world, after Big Ben, in England. I took this photo on one of Hammerhead's and my "Wilderness Days". We had driven around on the river road for him to enjoy looking at the river as part of his outing after breakfast at Wendy's that day. 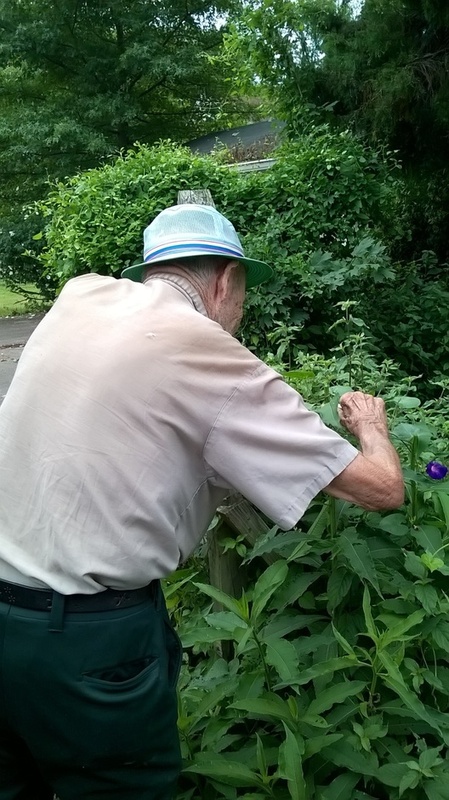 I planned something special for him each day, and Tuesdays were usually our "Wilderness Day" to drive or walk somewhere to see a bit of what wilderness is left in town. After we looked at the river that day, we drove past the old Colgate factory, where Daddy used to work and that he retired from after 30 years. It was a union factory, so they had "30 and out". After you worked there 30 years, you were entitled to retire, regardless of your age, so he did not have to wait until he was 65 to retire. I snapped this photo of the old factory the day Hammerhead and I were out for our Wilderness Day on July 18, 2017. I would have to check if that was a Tuesday or not, but that is usually the day we had Wilderness Day, so it probably was. Although, looking at this photo, it is obvious that it is deep summer, it is also obvious that the factory is abandoned. I have more photos of the old factory, as well as ones of the now also abandoned union building where Daddy probably attended his union meetings. I plan to look up more of the history of Colgate's when I get time. When I do I will publish more of my photos with what I find out. These were volunteer wild morning glories that came up next to the alley behind Hammerhead's house for several years. 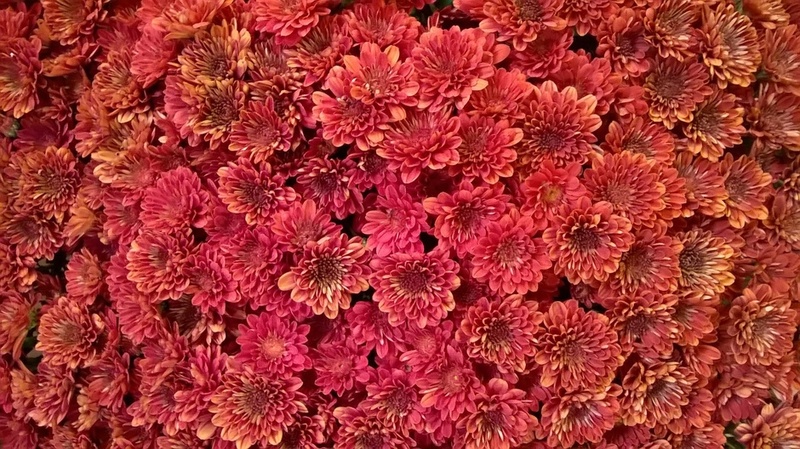 They were a mass of flowers and I managed to get many photographs of them. To the left in this photo is the neighbor's garage. Hammerhead's house is in the background of this photo. They started tearing his house down shortly after he died, but I managed to get some photos and videos of it before they started tearing it down and also in various stages of destruction. It is about torn down completely now, but I managed to salvage a few boards and a number of his windows, maybe all of the windows, that they'd put out in the trash. I drove by occasionally to see what they had put out in the trash and salvaged what I could for him. I took all the windows I saw, 12 of them, I think, and put them in my storage building. I don't know what I'll ever do with them, but I couldn't just let his whole house be taken away by the garbage men and trashed. I would have gotten more boards, but I had no way to haul them in Van Boy or any place to store them. I got all the windows I saw, though. I had to leave his storm doors because they were too heavy for me to take and to big for Van Boy to haul. I have a book on how to find out the history of a house, and after I get further along on Hammerhead's book, that I am writing the story of his life for him, I will try to find out the history of his house. I do remember he told me he'd lived there for about 25 years, so I have a little information to start this project later. Right now, I am just making notes of all the stories he often told me about his life and when he was a boy, and going through my diaries to find accounts of things we did together. I have lots of photos also. 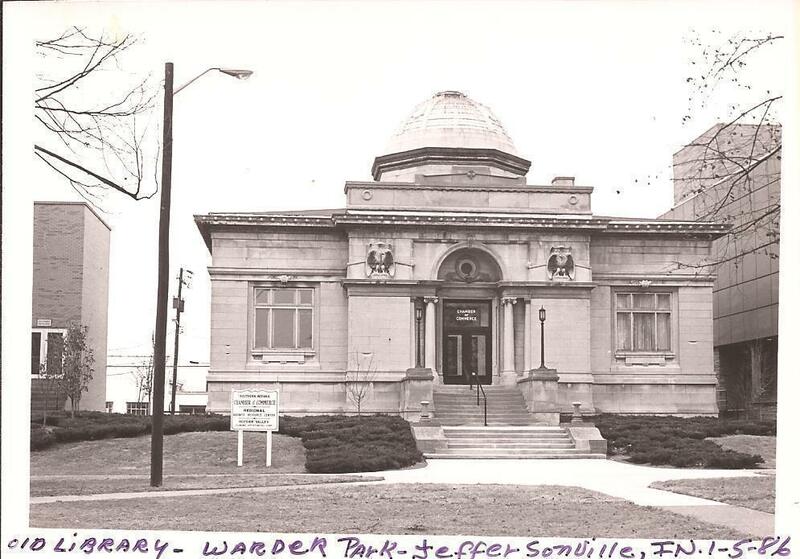 I am taking genealogy classes at the library also so that I can learn how to find information about his ancestors. He did not know much about his family. After I get his book written I will publish a hard copy book with Bookemon for permanent preservation so he will not be forgotten, but I will also publish the book and all the photos and videos I have here, which will be much more than can be put into a hard copy book. This will not be for awhile, because I have just started this project, but I will continue publishing at least one photograph of Hammerhead on each month's blog posts, along with photos of Daddy, Mama, and Gain each month. Once I get Hammerhead's book done, I will start writing the stories of Mama's, Daddy's, Gain's and other family member's life stories and genealogy and publishing the hard copy books and the books and many photos I have here also. These are more of Hammerhead's morning glories that came up in the same spot every year. In the background you can see part of the driveway in front of the old garage next door and a little bit of the garage roof. Hammerhead is looking at his morning glories. They always grew very tall with no tending by anyone, but someone often destroyed them, either through carelessness, or deliberately. However, they always grew back and Hammerhead and I always enjoyed looking at them. He had more morning glories that came up in a 5 gallon bucket that he kept beside his back door and carefully watered them. I have photos and videos of those also and will publish them later. I only have a little bit of research done on morning glories, but will add this little bit that I've looked up so far. When I get time to look up more and have more morning glory photos to publish, I will publish more research also. It is going on three o'clock now and I need to quit soon and get the cats their supper, and then go to the laundromat. So I will just work a bit longer for now and look up a few links for you before quitting for awhile. Once that is done I will be able to finish the diary entry and also the proofreading later this evening. So if you find mistakes before then, the blog isn't finished yet. As always I will post at the end of the diary when the proofreading is complete and the blog is considered finished for this month. 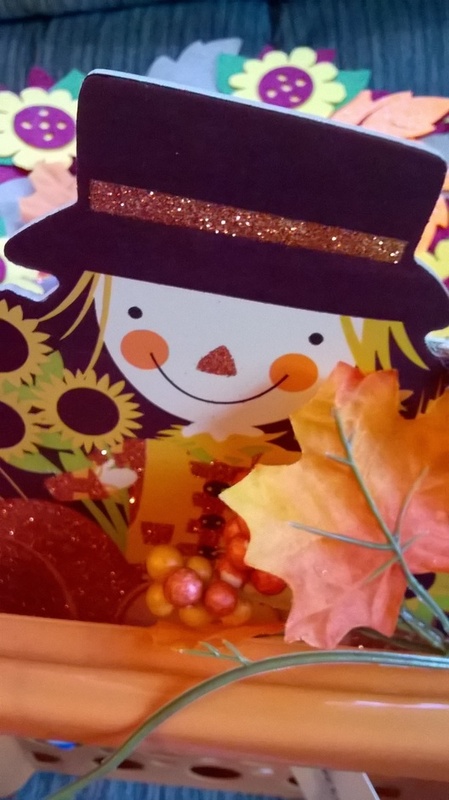 When I work on the blog again later this evening I will also check the Dollar Tree website to see if they have the scarecrow decorations that I used on the gift bags I made a few years ago. I know they have many of the same things each year, and that the store here in Clarksville has lots of fall and Halloween stuff in now, but I can't remember if they had the scarecrows or not. I just copied the link to put in this post for now, as I need to finish up for now. However, I will go back and check their website again, always fun to do, before I close out the diary and let you know if they have the scarecrows online. Going on 4:30 P.M. now, but have looked up all the links for you and posted them, although haven't checked to make sure they all work yet. Also found a good photo of the Colgate factory where Daddy worked that I thought would be good to use here, as well as some morning glory research I'd just started and thought I might as well include. Will check the links when I come back this evening and do the proofing and also check to see if Dollar Tree has the scarecrows on their website. That shouldn't take long, as I made very few mistakes this time and did not accidentally erase anything this time. I am getting better at not doing that anymore, and remembering to save my work more often since these extra entries are just directly typed on the website. So will finish when I get back from the laundromat. It is just up the street from where I live, so is easy to get to. My washer and dryer are both broken, and I have not had a chance to get them fixed yet. I can still partially use the washer, but it was raining this morning, so I could not hang the clothes outside on the line. So I can go to the laundromat for awhile until I get the kitchen straightened up a bit more and stuff moved so the repairman can get to the washer to work on it. They have ice cream there--the good almost homemade kind--so that gives me an excuse not to be in any hurry to work on the kitchen any more than I want to and when I have time. I always liked going to the laundromat, and since this one is close and I don't even have to get out on the highway to get to their parking lot, I'll get the washer fixed when I get time. Especially as long as I can get an ice cream cone while I am waiting on the clothes to wash and dry! I just got back from the laundromat about 45 minutes ago. Won't wait that late again--the laundromat was a madhouse! I thought I was the only one who still did the laundry on Mondays, but I guess I was wrong. Fortunately they have plenty of washers and dryers, so I did not have to wait. I did get my ice cream--one scoop of chocolate and one of strawberry, so that alone was worth the trip! After I got the clothes in the washer I got my ice cream cone and then still had plenty of time left to read my book that I brought with me. I am reading a really neat ghost story now, a paperback that I got at the flea market, called The School by T.M. Wright. The couple in the story have bought an old abandoned school building, and are living there, and hoping later to convert it to a bed and breakfast. Of course, it is haunted by the children who went to school there back in the 1950's! I took just a moment before calling this post finished to look up this book on Amazon in case anybody else might want to read it. Of course I found it even though it is copyright 1990. Amazon has everything! It is only available from third party sellers, but they have paperback and hard cover copies both at good prices. I have not looked up any information about this author yet, but in the front of my book it lists a whole bunch more books he wrote and he appeared to specialize in mass market horror novels. Amazon has some of them and the others could probably be found by searching. I will review this book and publish my review later and also try to find out more about this author to publish with the review in a later post. The book is fast reading, though, since it is only 245 pages. I never heard of the author until I found the book at the flea market and probably he never achieved the fame he deserved. Most authors don't, especially if they write genre fiction. Only a few, like Stephen King, ever get the fame and money they deserve. Even though the laundromat was crowded, I was glad for the break away from Computer Boy and working on the blog for about an hour and a half, and there should still be plenty of time tonight to finish the diary and proofreading. Then I'll be caught up on the blog until time to post the Halloween blog next month, as soon before Halloween as I can get it done. After I got home from the laundromat and put part of the clothes away, I went out to count Hammerhead's May Pops, as I do every day and record them in the May Pop diary I started to keep track of how many he has each day. Today at a little after 7 o'clock this evening he had 17 open. The flowers, like morning glories, only last one day, so I only count the ones still fully open. 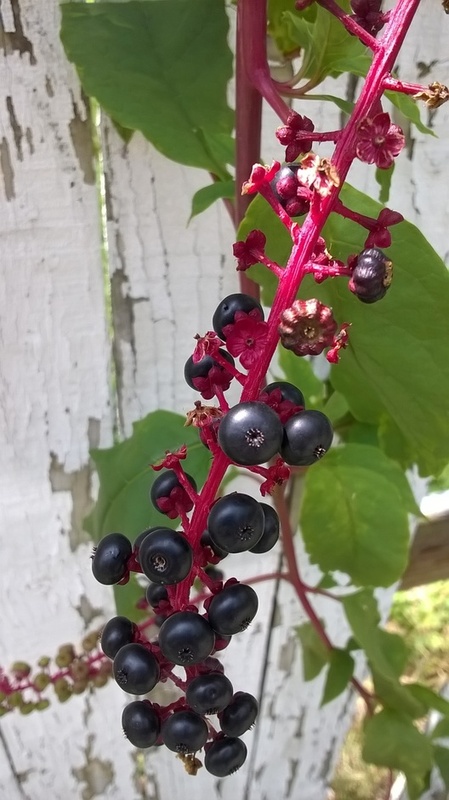 Some were already closed, fading away, and there is more and more ripening fruit, which I will leave to make seeds for even more May Pops in this area next year, and also to share with some of my friends who want to get a start of the May Pops. So far, this year, the most May Pops Hammerhead has had in one day is 24. That has happened several times. I had been taking photos and videos of all of them, but there are too many now to take photos of all of them, but every few days, at least, I try to get more photos, each more beautiful than the last. The giant bumblebees love them and are usually always on the flowers when I go out to look at them, feasting on the nectar. I do not disturb them and they do not bother me. I also watered the Passion Flowers while I was outside. They are still very small, but the largest one is twining on the fence a bit more each day. She is unlikely to have any flowers or do much this year, but the Passion Flowers, like their wildflower sisters, are also perennials, so once I get them started they should be a mass of purple and white flowers covering that sunny area on the fence. 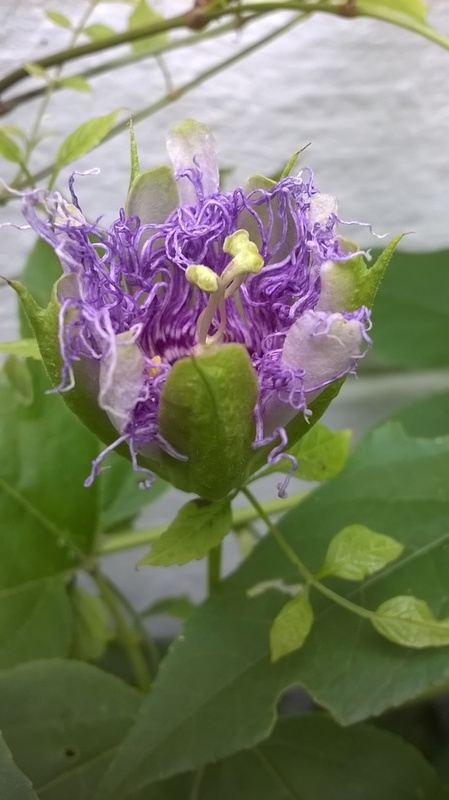 I water the Passion Flowers everyday it doesn't rain, but there is nothing to do to the May Pops now except to, later this fall, make them a better trellis to climb on next year, and to keep their area trimmed from grass and weeds. They are growing thicker and thicker now, though, so I have an idea they will soon be choking out everything else themselves with no help from me. They do not need watering, as they are big enough that is not necessary now. So the only thing there really is to do is to enjoy their beauty. Before getting back to the blog, I also checked Dollar Tree's website, as I promised to do, for the scarecrows I bought from them a few years ago and used to decorate gift bags. I did not see them online, but that does not mean they don't have them in the stores or might get them in the stores later if they don't have them now. 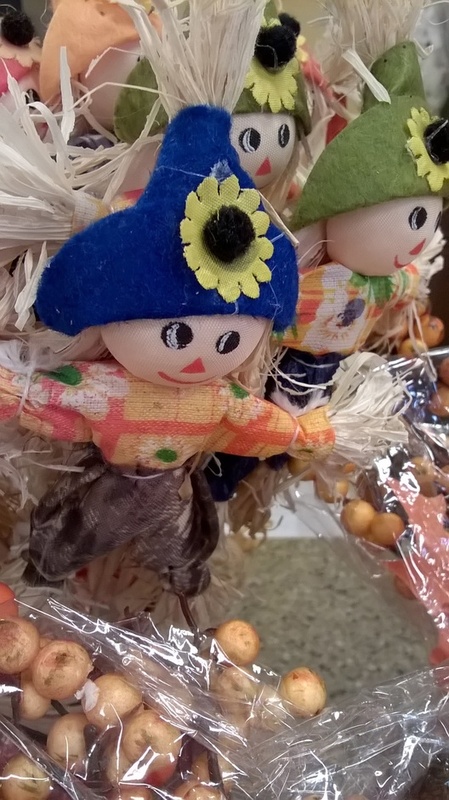 I saw some of the same kind of scarecrows and other fall decorations that I know they have every year, so even if they don't get any more of the kind I had in again, there are still plenty of other fall decorations and scarecrows available online and in the stores. And anyone who can do crafts could easily make their own using the photo I posted as a pattern. I think the ones I bought were thin wood decorated with paint and glitter, but if you couldn't cut ones out of wood, they could be made out of cardboard instead. The berries and leaves in the photo are some of the Dollar Tree artificial flowers that they have every year. Finally, before closing out the blog for this month, here is what is coming up for next month. Since I am getting the September blog posted a bit earlier than I did the August blog, and also because the October post can be made anytime before Halloween, I have over a month to finish the next chapter of Mariette's book and get it typed, proofed, and posted. I have already got the chapter started, just never got any time to work on it. Even though I want to try to get more done to the house and also work some in the yard before cold weather, I figure I will have time to work on the chapter too. Especially since, with global warming, the autumn around here is lasting until almost Christmas now. So there will be plenty of time for both, and I will make some time to start working on the book again, one way or the other. I already posted previously that the next chapter will be titled "Nettie, Roy, And Meaghn Louise Camp In The Old House And Simon Has His First Guests". This chapter will take place in mid June, which is inexorably sliding into late June. The time is the late 1970's. I can't remember if we moved to Wheeling in 1977, 1978, or 1979, but I have a copy of the abstract and I could check that to figure out when we bought the property, and I am sure we had it and worked on it for about a year in our spare time, just as Curt and Mariette do on their property in Carrollton Location. I could also check the dates on some of the photos in Mama's old books to pinpoint the approximate time better. I may if I get time to check that before writing this next chapter, or if I think it is necessary, mention the year. Or I may just leave the time in the book as the late 70's. In Curt's and Mariette's long ago world, it will always be the late '70's. Sometimes, when Simon and Mariette unwittingly begin to restore the past, it will be even earlier than that, back in Simon's era. That won't happen for awhile in the book, but Mariette has hinted to me that when the past begins to remake itself and gets completely out of both hers and Simon's control, that it will be possible for her to actually enter that past. She hasn't told me a lot about that part of the story yet because she herself doesn't know much about it since it hasn't happened yet, but she has hinted that besides being a ghost story her book is going to be a time travel story as well. This next chapter will be about the weekend Roy and Nettie, Mariette's parents, help Curt and Mariette move to Carrollton Location. Curt has Meaghn Louise that weekend, so she will get to camp in the old house with Roy and Nettie. Since Mariette's parents and Meaghn Louise are "company" Mariette, of course, lets them camp in the old house, and she and Curt will camp in the new mobile home that weekend. Mama and Daddy often camped in the old house in warm weather when they visited us and Mama loved the old house as much as I did. Curt, Mariette, Roy, and Nettie will spend Friday night, Saturday night, and Sunday night in Carrollton Location finishing up everything absolutely necessary so Curt and Mariette can move, and moving Curt's and Mariette's furniture from Auto City to the new mobile home in Carrollton Location. Meaghn Louise will only get to spend Friday and Saturday nights and until Sunday afternoon with them because Curt will have to take her back to her mother's house late Sunday afternoon. Curt would ordinarily have to return to work Sunday night, but he arranged to take a vacation day so they would have the long weekend to move while Mariette's parents could help them. This chapter will detail the move, part fictionalized, and part things we really did when Mama and Daddy visited us as often as they could. Nothing unusual will happen until Sunday night after Meaghn Louise has gone home and Nettie and Roy are sleeping in the old house alone. That night Nettie wakes up in the middle of the night and sees Simon. None of the others have seen him yet, so she is the first to see him. The chapter will end when the weekend ends and they all go home on Monday morning. Nettie will be more determined than ever that she must find out more about the old house's secrets and its past so she can protect her daughter from the ancient evil that she is now sure is there. She doesn't want to tell Mariette what she saw, but wonders if she will have to so that she and Mariette can combine their efforts for their search to uncover the past. She already knows that Mariette is planning to do just that, alone if she has to, and that might be even more dangerous for Mariette. Nettie is still convinced that for some reason Mariette is the only one in danger from the ghosts of the past. This chapter will end with Nettie undecided exactly what to do, and saying nothing to Mariette about what she's seen yet. Mariette, who knows her mother well, is convinced that Nettie is keeping a secret from her. There will also be a section of this chapter for Simon, who is overjoyed because Mariette, who he now believes is an angel come down from Heaven to restore his long vanished past to him, has at last moved to Carrollton Location. The past will soon be back again now that she is here, Simon is sure. The November blog post will be another chapter of Mariette's book. It is full summer by then and Mariette has set up her office in the old house, just as I did. She goes over there to write every day after her housework is done, just as I used to. This chapter is already written and just needs to be typed and a bit added for Simon. When I started this book many years ago Simon was just a ghost, but now he has become a full character just like the living characters, so he has to have a bigger part in the book now. After that chapter, "Mariette's Haunted Office", is published I will have to write a few more chapters detailing Mariette's and Nettie's search into the old house's past. I didn't originally have those chapters in the book, but just switched back to some of the other characters' stories, Robin Michaels, the bestselling romance novelist, I think was next, and maybe never did get to much detail at that point in the book about the search for the old house's past. Nettie and Mariette wouldn't have waited that long to begin their research of the old house's history, though, so those chapters must be written before I get back to Robin Michaels or anybody else's stories. Hopefully, I will be able to get the chapters I need written in time to use, but if not, then Mama and Daddy have agreed to be "guest bloggers" again for me for a few more posts. It is getting late, past 9:30 P.M. now so I am going to finish the blog tomorrow. I did the first proofreading of the manuscript copy, as I always do, but I still need to check the published copy and also the links. So I will do that tomorrow. I am getting tired and it would be possible to overlook mistakes now. It won't take long to read the published copy one more time and check the links--proofing the manuscript is the most time consuming and tedious. So I will post when that is done and the blog is considered published. Until then, if you find mistakes or some of the links don't work, the blog isn't finished yet. 7:40 P.M. I finally got back to finish proofing the blog and checking the links. It is now officially published for this month and all the links work. Got to get out and water the passion flowers now before dark. Hammerhead had 10 more May Pops in bloom at 5:55 P.M. this evening. I was going to post another photo of one of them, but Cell Phone Boy hasn't uploaded them to One Drive yet, so will post more May Pops another time. Sometimes One Drive is slow--probably too many webbing tonight! Anyway, the blog looks good and is now officially done for this month. Next time I work on my writing I will be able to start writing the next chapter of Mariette's book again! Hope you find something you enjoy reading here. Until next time. And thanks for reading my blog.